One year ago on August 28, 2008, after lurking around many of you for awhile, I wrote my first blog post. You can read it here. It's so interesting to look back at that post. Nobody commented and that was ok. For a long time I was embarassed to tell people I had a blog. Sometimes I still am embarassed because it seems like such a frivolous way to spend time. But in this past year I have said, "I love my blog!" so many times. It's really not just the actual blog itself but the connections I've made communicating with you. You are the nicest group of people. It's just so cool that we can connect in this way and discuss things that we have in common! You all inspire me to cook, decorate, plant, pray, learn, and be a friend. Those are good things! Anyway, I just want to say THANK YOU to BJ and all of you from the bottom of my heart. You have coffee with me every morning and I just enjoy it so much! If you are ever coming through town I would love for you to stop and have a chat! To celebrate this anniversary we will have a give away...be on the lookout...I haven't been shopping yet! OOO, Stacey girl...thanks so much for the kindness you are showing to me and others. I am so happy that we've "met" and Oklahoma isn't all that far from Texas. Who knows...one of these days I might just surprise you with a phone call and a "can we have lunch before we go shopping?". How fun that would be. Blogging came at the perfect time in my life. I now have more time to do things that I love doing...blogging being one of them. I have more dishes, roosters, cookbooks, toile and my tablecloths and napkins have increased by ....a bunch!...all since blogging. It's so much fun!! Love to you, sweet one..
Really? I am amazed...I thought you had been blogging a long time when I found your blog; I actually started on Aug.18, I think....anyway, it has been a very fun year getting to know you and maybe one day we will have a TX/OK blogging friends meet up! How cool would that be??? Hi Stacey, Congratulations on your blog. I really enjoyed checking it out.I can say that I also enjoy blogging and getting to know other people and learn about all kinds of girl things. I was just thinking the same thing the other day. Bloggyville is so wonderful. I actually found lots of other people that like to decorate for the seasons, etc. I look forward to checking out the blogs every day, and it IS such a great group of sweeties. Congrats on your one year anniv. I enjoy your blog. Happy first yr! I haven't been here mush this summer, or any blogs for that matter, cause my life is upside down (we are moving)and I have missed my visits. It has been delightful visiting you this past yr.
Congratulations Stacey! I also found my way here from RMS. It's such a nice community. It's so fun to make friends and see all the creativity out there. OH...guess I should "give props" to Stacey too for being a mentor of sorts for me when I first started blogging...thanks sooo much! Have a great weekend. Always great to read the happenings of a fellow Oklahoman. Keep up the writings - looking forward to many more in the future. Congratulations on your aniversery. I too feel a little funny talking about my blog to my non blog family and friends. I feel they really can't comprehend the whole blog thing until they experience it. Have great weekend and to another memorable year in blogging!!! Happy 1 Year Anniversary!! 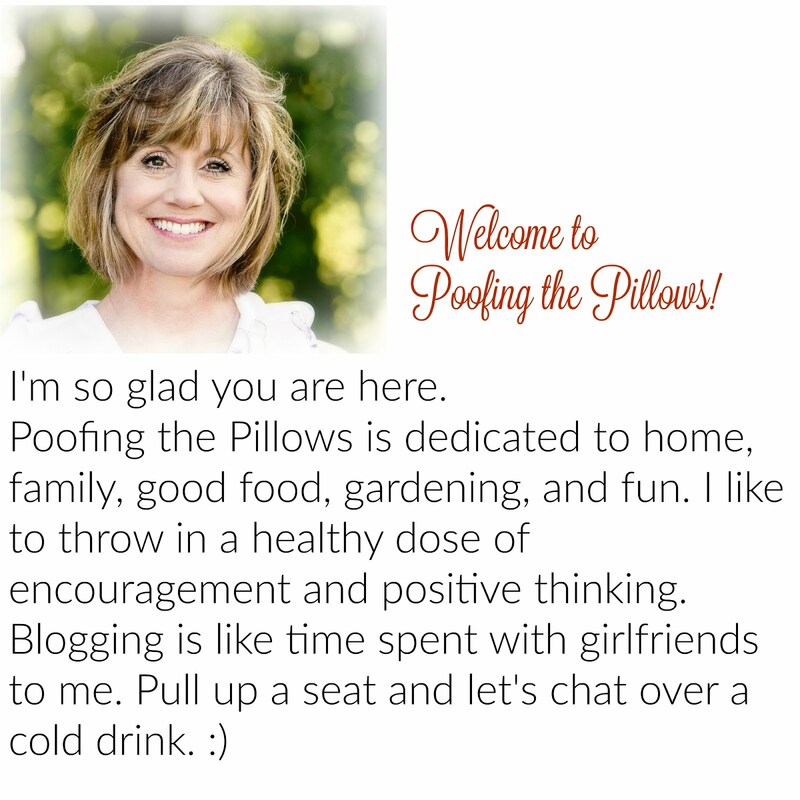 I love visiting your blog and look forward to another year of Poofing the Pillows! Happy 1 year anniversary!!!! I KNOW we are going to meet sometime since we are only about an hour away from each other. I sure hope it is soon!!!!! You have a fabulous blog and I always enjoy coming over to visit! Hi Stacey, congratulations on your blogging anniversary. I am certainly glad I found you....you are warm, funny, graced with style and all the things I like in a gal. Isn't Blogland wonderful....the friendships we make are special. And, yes, BJ, is awesome...she is a great gal. Hope you have many more happy blogging years! Well said, and congrats to you, Stacey! Your blog is such a happy place to visit! Congrats on your one year anniversary. Isn't it amazing the fun and friendships that are formed via the internet. Your blog is truly beautiful.. Bj is a dolly, always so kind and generous. You struck gold when you met her.. Again Congrats darling.. I'm pretty new to blogging and just wanted to say 'Congratulations' on your Blog Anniversary, and thank you for encouraging us "newbies" to keep going! Happy Bloggy Birthday! You have such a great blog and you are such a sweetheart, I always enjoy stopping by for a visit! Congrats on achieving one whole year of blogging! I enjoy your blog so much! Having you as a blogging friend has been a joy! Thanks for leaving comments so often on my blog. Congratulations my friend! Thank goodness you started blogging, and thankfully I discovered your blog. I have had so many joyfilled visits here and continue to learn a lot from you. Thank you for blessing my days with your kindness, warmth, creativity, gardening skills, and vibrant "reds". Congratulations on your one year anniversary! I love blogging and getting to know wonderful friends like you. Thanks for your inspiration and kindness. Have a wonderful weekend! Hi Stacey, I was wondering if you could help me out with one of the blog gadgets. I've been trying to find the one at the bottom of your posts that shows the 3 photos of other posts and says "you may also like". I looked through blogspot and searched on line but couldn't find it. Do you remember where you got it? Congrats Stacey! I agree...Blogging has been a wonderful experience for me too. I'm so glad we "met". I alway enjoy visiting your blog! Congratulations on your 1 year Anniversary and many more to come! congrats lady! we love you too! BJ is awesome isn't she? Congratulations on your first year. The Blog World is such a wonderful and small world - I found your blog because of BJ. She was also one of my first visitors and blogged about my blog. She is a lovely and dear person and so are you. Best wishes and may you have many more happy years blogging. Congratulations on your blog anniversary! I am an avid follower and enjoy your blog so much, I smile all the way through! Just stopping by to say hello and wish you a very happy one year blogging anniversary! It was so nice that you paid tribute to BJ in your post. She's wonderful, and it says very good things about you that you appreciate and honor her "wonderfulness!" You have done a fantastic job with your blog this past year! Yours is one of the first I check for a new posting daily. LOVE it! Thank you being such a wonderful friend to me. I appreciate it and "you" very much. I snuck down to the computers at the hotel this a.m. to read and check blogs...boy am I addicted or what!! Anyway, Happy Anniversary on your blog. I agree..blogging for me has been wonderful. I have found so many awesome ladies who share the same passion I do and who also love the Lord and that is way cool! Have a wonderful Sunday, we are off the Cubs/Mets game. Happy Anniversry!!! I am so glad that you decided to start blogging one year ago...so that you can be my blogging buddy today...YEAH!!! I look forward to "getting together" with you everyday and C can't wait to go throught the holidays "together"!!! I am a huge fan of your wonderful blog and YOU!!! Congrats on a year of blogging! I'm so glad you liked the pizza. If you have any leftovers it's really good cold too! Hey, I have my morning coffee with you guys too! Best way to start the morning! HI! I have read your blog often. It is quite welcoming. I am from Texas, but I have recently developed a cozy little connection to Oklahoma; I just moved my youngest child (a daughter) into her dorm for her first year at OU. Great state, and I find that I like it a lot, and she LOVES Norman. Thank you for a nice blog! I love looking at everyone's roosters too! There are so many and they are just fun. They can be fancy or silly and they are all just lovable! I honestly don't see me ever tiring of having them in my home. Great idea about changing the shade on the little lamp on my hutch. I also thought of hanging a rooster tassel on it. I'll have to look around and find one. Hard to believe that our friendship spans some 20 years now! Without your encouragement I would never have had the courage to start my own blog! And you know it really saved me at the time! You and I have talked more than once about what we get from blogging! I loved being on the phone the other night, talking and going from blog to blog! I can't ever say enough how much your friendship has meant to me over the years! Here's to the next 20 years! You are the best and I love getting to know you and your sweet boys. I love your blog too. Isn't it wonderful, all the benefits we get from blogging? I've met so many great people and learned so much! Your blog always gives me great ideas, and I, too have my morning coffee with my blogger friends! Congratulations on your anniversary of blogging:>) It's such a wonderful, fun thing to do, and I love your blog!